This book is devoted primarily to gaining strength and size through isotonic training. This may sound simple enough, but I mention primarily because some bodybuilding principles will be incorporated for the ultimate purpose of gaining strength in the long run. The probability of size is mentioned because of variables like individual body metabolism, food intake, life style, age, goals and even attitude. Isotonic training is mentioned because of the multitude of confusing devices placed upon the commercial market – devices such as Nautilus, Universal, Isometric and various spring and rubber contracting and expanding equipment. One of the first lessons a novice learns about weight training is that many sets coupled with high repetitions constitute bodybuilding training or what is commonly referred to as pumping iron. 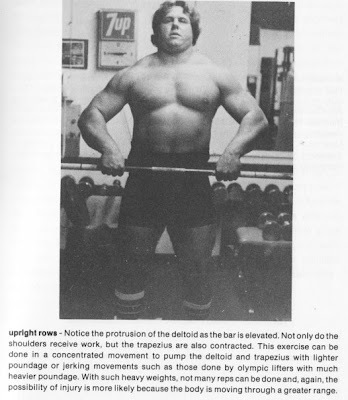 The pump of the inflated feeling, which is blood being sent to the worked muscle and toxins being taken away, is what the bodybuilder works for and holds as long as possible, for through this method the ultimate in muscular shape and definition will be accomplished, not necessarily more muscle mass. Other training maneuvers and principles are necessary for size. Forced feeding and the overload principle are the most important. In contrast to the bodybuilding principles, the novice also learns that fewer sets and fewer reps, working muscle groups rather than one singular muscle or part, will engender a body which is able to handle more prodigious poundages. The power trainer does not work for a pump; certainly a few hard sets and reps of maximum effort will raise the strength level and the blood pressure for a short time, but no pump will occur. Of course, nor does the power trainer want a pump, for the pump is not making him any stronger. It can also hinder his body’s efforts to recuperate in time for the next big poundage workout. There is, however, a rehabilitative and conditioning benefit for the power trainer to utilize a small degree of pumping at the end of a workout. This method will be detailed later. Our bodies differ, and because of this, some people can eat all day long and hardly gain an ounce of bodyweight while others gain easily with little intake. Body metabolism is subject to change by the individual if proper training and eating habits are used. Some people run around, constantly busying themselves every minute and making sure there is something to do until slumber. Others live at a slower pace and shun too many chores or socializing and, therefore, rest the body more. These lifestyles linked with either power training or conditioning can alter the body metabolic rate to suit one’s goal. Why would one want to alter this metabolic rate? Why, to become bigger and stronger or smaller and more defined or, possibly, other combinations such as smaller yet stronger by body formula, that is, more power pound for pound of bodyweight. Of course, attitude is important in any sport or endeavor – the power of positive thinking; many lifters discover this in their training. The ordinary Olympic or power bar cannot be beaten when pushing for power. 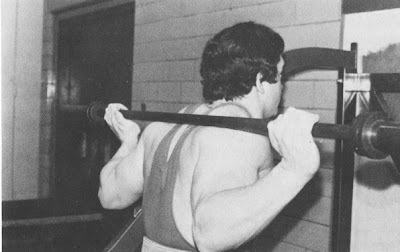 The stabilizing muscles are used to steady the bar. These smaller muscles are either cut off or interfered with by machines. The machines stabilize for the lifter who only concentrates on the push, and spring or rubber equipment is too much in the other direction. Spring equipment is akin to lifting on ice in which balance becomes primary and the push or pull secondary. Both are necessary, and the best way to develop powerful stabilizers and major muscle groups is by using them all as nature intended, which the free bar provides, not by confining or confusing either one. References are made to rehabilitation therapy and other corrective measures that can be done by the athlete to aid in his quest for power. I am not a physician. The exercises that are mentioned for therapy were gotten from doctors, a medical school, friends, and from personal experiences. People who have physical disabilities or any doubts regarding the use of such methods should refrain taking part in any of the therapy. Confusions abound in the weight room. 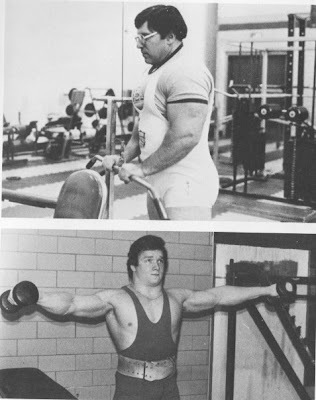 Even the most experienced lifters are afflicted with times of perplexity, especially during stagnation. The novice begins where others do, at the local YMCA or health club. Most of the lifters, through hearsay, either follow something similar to 5 sets of 5 reps or follow a routine found in a magazine illustrated by some noted bodybuilder or powerlifter. Often the problem of stagnation develops because the lifter is following a prescribed routine set upon paper which may not be precisely for his body’s recuperative powers. So he finds himself making no progress, or he finds a weakening in the strength level. It is difficult for a novice to follow a routine which took years for a master athlete to develop. It is comparable to placing a novice boxer in the ring with a champion and expecting the novice to do well. It takes time to find one’s strong points and weaknesses: how many sets and reps work best for gains, how many workouts of the same exercise per week, the difference between various exercises, and how one rule for one exercise does not apply to another, how a rule may be for one lifter but not another, the rest period between sets for best results and various other factors that make a difference: hyperactivity, little sleep, improper diet, emotional disturbances, or just plain getting cold between sets and lack of concentration. These are just some of the variables. WE FIND OUT MORE AS WE PAY OUR DUES IN TIME. Speaking of time is appropriate here because this is a sport of patience. It takes a long time to make the gains of your dreams, and injuries are some of the biggest obstacles to those goals. Yes, injuries – another variable that must be contended with. Any time joints, ligaments, tendons, cartilage, and muscle are pushed to unaccustomed horizons, injuries are inevitable. Even nerves can become impaired by bony spurs. It is extremely difficult to evade injuries when a lifter is pushing to his utmost – whatever utmost is. To begin answering the multitude of questions proposed above, it is best to remember that we are, each of us, a different structure, which enables one person with longer arms, for instance, to deadlift better, and not bench as well as the person with shorter arms. Also, our differences in heredity, athletic backgrounds, physical inclinations, and metabolism will determine how much we will progress. Mentioning the word determine reminds me of positive which I have observed in those who had begun with little ability and yet accomplished beyond the expectations of many. We all must start somewhere, so we begin where we are, with what we can lift for one maximum effort. If this is either your first time lifting or just getting back into training, it is best to stop at the maximum single. The mistake so many health clubs make with new people is the instructors start the prospects very light but carry them through many exercises for many repetitions. This method builds up too many toxins and creates swelling in muscle. They believe light is the key. It is not. One can and should go heavy enough to a near maximum effort. I always feel that maximum effort that which a lifter may think is maximum at one time, but may find that with more determination, he has now lifted a heavier poundage and reached a depth within his mind that he never knew before. After a few weeks of singles and doubles, the body should be ready to handle more sets of more repetitions. The routines will vary depending on the exercise. The large muscles of the legs and back hold strength longer than the smaller muscles of the triceps, deltoids and pectorals. So the bench press will, therefore, need more sets and reps more often than the squat and deadlift. 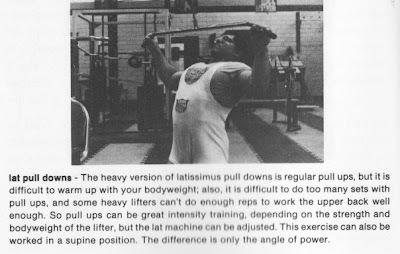 Routines for these lifts will be discussed in their respective sections; however, great powerlifters usually squat twice a week, one light and one heavy. Even though some greats been known to vary from three times per week for some lifters and only once a week for others, the usual is twice per week. The deadlift is usually worked once a week by great powerlifters because of the difficulty of recuperating the back muscles and joints. 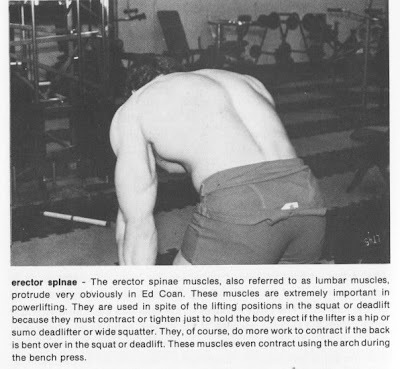 If the back remains tired, so goes the squat; even the bench press is affected because of the contraction of the spinae erector muscles. Although most powerlifters train the deadlift once per week, variations among the greats can be observed from three times per week to once every two weeks. Because of the blending of the effort of so many smaller muscles, the technique of using the entire body with speed seems to call for more workouts per week. Most of the greats bench twice per week, but variations from five times to once per week exist. Bodybuilders need to work fast to keep the pump going; therefore the time between sets is reduced two or one minute or according to body feel – when one feels ready. Often, to keep a well rounded pump, circuit training is employed, that is, going from a triceps pushdown to a deltoid lateral raise to a biceps curl, etc. Powerlifters need more time to rest in between sets; also, to assure a rise in strength level, powerlifters need more time between workouts. 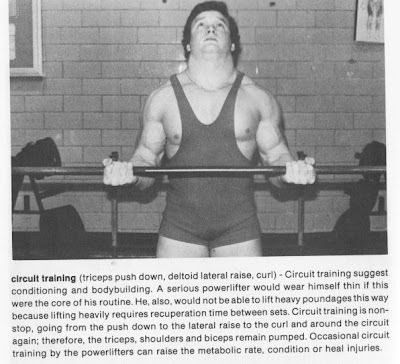 Of course, because of slower and less frequent workouts, the cardio-respiratory development in the powerlifter will be less than that of a bodybuilder. The range of rest time between heavy sets should be no less than four minutes nor more than six. Below four minutes that body has not fully recuperated from the previous exertion, and lifting too soon would be creating some obstacles: 1) The weight will feel heavier; this is not the objective of the lifter – to teach the mind that this particular poundage is so heavy. 2) Again, lifting too soon will develop more conditioning instead of strength, which is to tolerate or put up with the weight rather than to put it up more easily. Waiting too long between sets is obvious; the body cools down too much, and injuries can occur. Most of us understand the overload principle to be either something extremely heavy that the body can handle or else more than it can handle; therefore, the movement with such an extraordinary poundage will not be performed in full, but in part. 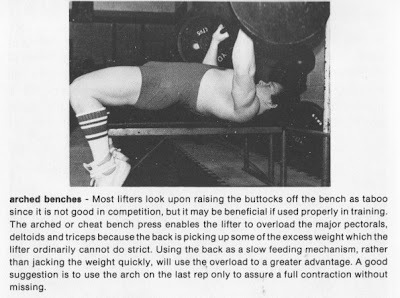 This is how other versions of the three powerlifts are created: high squats, arched benches with the buttocks off the bench, and deadlifts from the knees. Many lifters employ these or other partial of cheat forms of the lifts to accustom the structure to heavy weight. Paul Anderson used to think in these terms: lift 1000 lbs. one foot, and you will lift 300 lbs. three feet. The numbers may be general, but the thought has been found to hold true. 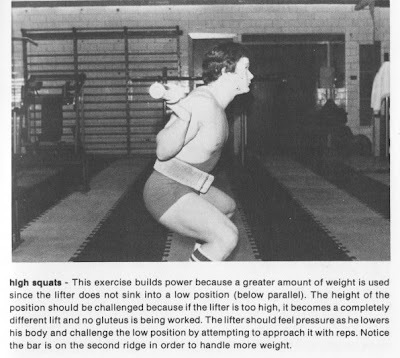 Many squatters, for instance, will train the squat one to three inches high, hardening the body and mind to the movement of prodigious iron, and after training the high system, the lifter finds himself thirty pounds stronger below parallel than before he started the partial program. This principle can be applied to any muscle group; however, the partial movement cannot be too far removed from the actual full movement. 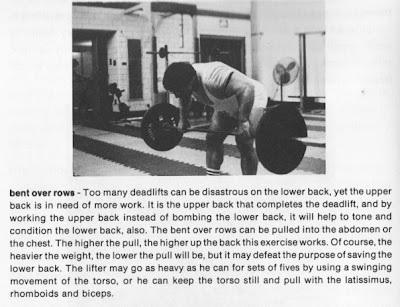 Conversely, some lifters think if terms of isolating fewer muscles rather than overloading many. Using the squat again as an example, trainers who isolate will place the bar higher on the back rather than below the deltoids. They assume a more upright position, using more thigh and less hip and back. I have known both techniques, squats high on the back and low on the back, to work well at different times during a lifting career. The conclusion that I came to is that the body and mind become stale to the weight, movement, and routines; it, therefore, is necessary to adjust at this time of stagnation. Staleness is gym jargon for inability to recuperate. The questions are why can I not recuperate from this routine and what can I do to assure recuperation to continue satisfying gains. Changing the body’s ability to recuperate by the use of anabolic steroids is one possibility but one I cannot advocate because of alterations in the endocrine system and adverse side effects. If one wishes to undertake this approach, a doctor’s care is the only way to go. The most clever route to recuperation from workouts if also the most complicated and perplexing. Lifters of all levels struggle with the systems and avenues to recuperation. It must be remembered that it is not the amount or intensity of work that matters as much as it is the ability for one’s own body to recover from the intense pounding. If the body were able to fully recuperate from any given amount of depth of exercise, we would all be in a range between champion and superhuman. That is, the entire physical level of human accomplishment would be that much higher than it is; therefore, in coming back to earth, we must find routines, rest periods, lifestyles, and goals we can live with. The impractical person is one who demands too much from his workouts and expects to gain in leaps and bounds. He must find a happy medium for himself through a viable program. For example, routines are not a panacea, nor are they the only consideration. Again, a major principle in strength gain is low sets, low reps, more intensity devoted to the sets done, and only a few exercises working masses of muscle, not singularly isolated muscle. This principle in itself conjoins smoothly with the thinking on recuperation. It is easier to recover from few than many. It is something the body can handle, at the same time it would not be applicable to strength gain if we did not put the body through a trying experience-hence-intensity. With this principle established, there are further considerations involving routine. One person’s body may take 5 sets whereas another may be able to take only 3 sets to recover fully by the next workout; these must be experimented and explored by the individual. It is only then that the lifter will know which works best for him. Some bodies are capable of tolerating more repetitions than others. This also must be explored individually. What is considered few reps to one person may be extremely high to another, not only to the mind but to the body. How can 10 reps be high to a person who is accustomed to doing 20 reps per set? Now, according to the principle, fewer reps make for strength, but again, fewer to one may not be to another and must be explored for best results. 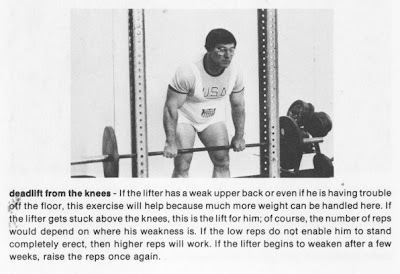 One other factor here, used by me and other lifters, is that higher reps can also rehabilitate intensely worked areas and can by indirect route lead to recuperation and, thus, gains over a longer term. In short, bodybuilding heals. The principle for power is great if managed properly; if mismanaged, it can be crippling and lead to disaster for the joints, tendons, ligaments, and muscles. Of course, a serious competitor subjects his body to grueling torture and learns to love it to become the best. The pains, surgery and mental torment all become worthwhile for the minute of glory, whether it be for the win, a private personal attainment, or recognition by others. I have observed many lifters bench pressing to a single rep which completes their workout. This is only the beginning of mine. Most powerlifters do between one and five reps in the bench. Even though this works for most, this gave me very little gains. I had to increase sets and reps and adjust the routine, which will be shown in detail in the section on the bench press. The bench press is a different animal. Rest between workouts is as important as the routine, for without the proper amount of rest between workouts, there can be no strength gains. This also differs per individual, but some generalities are younger lifters recuperate faster than their older counterparts, and one can recover sooner from lighter workouts than heavy. Also, it is easier to recuperate from one set of one single than four or five sets of the same single. After the sets and reps become intermingled, the cellular variables for recuperation become too many and only experimentation will tell true. As there is a line of time needed to recover, there is also a line on the other end of the rest period. If too long of a duration elapses, the body becomes untrained to the enormous poundage it once acquired. In other words, you begin to lose it. The end of the rest period also varies but, generally, no less than 5 days between heavy workouts and no more than 10. These time limits differ for different lifts. Remember, the larger muscles of the back (deadlift) and quadriceps (squat) hold strength longer than triceps (bench). This is not to say subsidiary muscles cannot be worked in between or even that the same muscles can’t be worked lighter. What is considered light is strictly individual; for example, a lifter may desire to work upper back between deadlift workouts. He may employ upright rows or bent-over rows or lat pulls if he feels this is a weak area which needs development. My own lifts communicate to me that if I rest longer than eight days in the squat, six days in the bench and two weeks in the deadlift, between heavy workouts, I begin to lose strength. One other variable few of us consider is occupation. A person who works in a sedentary job al week is more likely to recover from a heavy pounding than a construction worker. In the iron game man of us have been aware of lifters who have little or no livelihood and find others ways of support because they are so devoted; they believe the slightest interferences cannot be tolerated. Toleration is a good word to explain this problem in opposition to the above philosophy because the tolerance is something that happens within the body after a period of time. The body becomes accustomed to the routine of a rigorous occupation, and eventually, even those with rigorous occupations can gain strength greatly. The point is “we don’t have to pamper ourselves or get carried away with protecting ourselves from work.” Overwork is one thing, but maintaining one’s individual dignity is quite another. After months of dealing with routines, rest periods, etc., the lifter will clearly receive a message by comparing his gains and strength to others. It is healthy to utilize the comparison practically because it allows the lifter to seek realistic goals. All people can improve to heights they never thought achievable, but all lifters cannot be a Bridges, Pacifico or Kuc; therefore, one can only become frustrated with goals that are above one’s ability or too highly imaginary. A great anti-frustration goal is to try to beat your previous total. It satisfies immediate hungers, and in due time the lifter will find that other lifters are now trying to catch up to him.